You are a factory worker at "Rockets, Sprockets, and Pants", carrying nothing. You've created a new design of rocket pants which you'd like to show off to your favorite superhero, EnigmaGirl, who has finally agreed to a romantic date with you this evening. But getting yourself and the pants out of the factory will be difficult with MonkeyMan Shatner breathing down your neck. 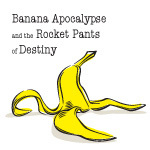 Banana Apocalypse and the Rocket Pants of Destiny (Emily Short; 2001; Z-code 5). Download SpeedIF_Y.zip from the IF Archive. All six games entered in SpeedIF Y. The story file is SPEEDY.Z5. Banana Apocalypse and the Rocket Pants of Destiny (archived) - at Baf's Guide. Banana Apocalypse and the Rocket Pants of Destiny - at IFDB. Banana Apocalypse and the Rocket Pants of Destiny - at IF Ratings.